Revit deals in realities. The reality is, many Rooms are not rectangular. 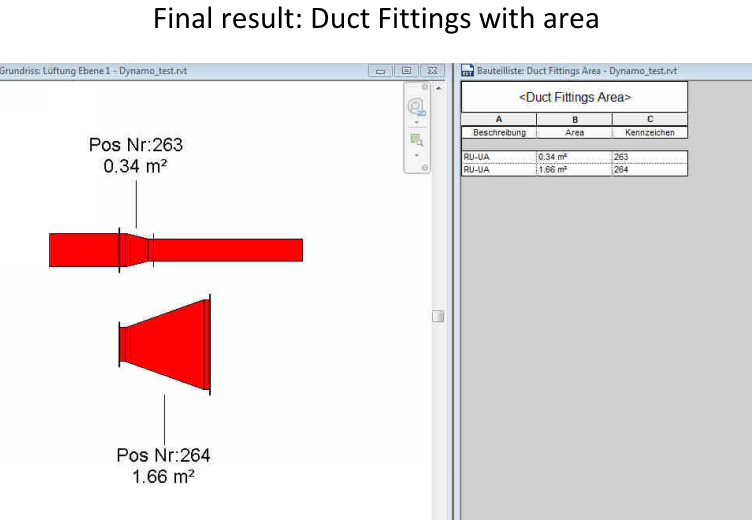 So we can forgive vanilla Revit for not having a built in tool or method that could only really ‘guess’ at X and Y room dimensions for irregularly shaped rooms. 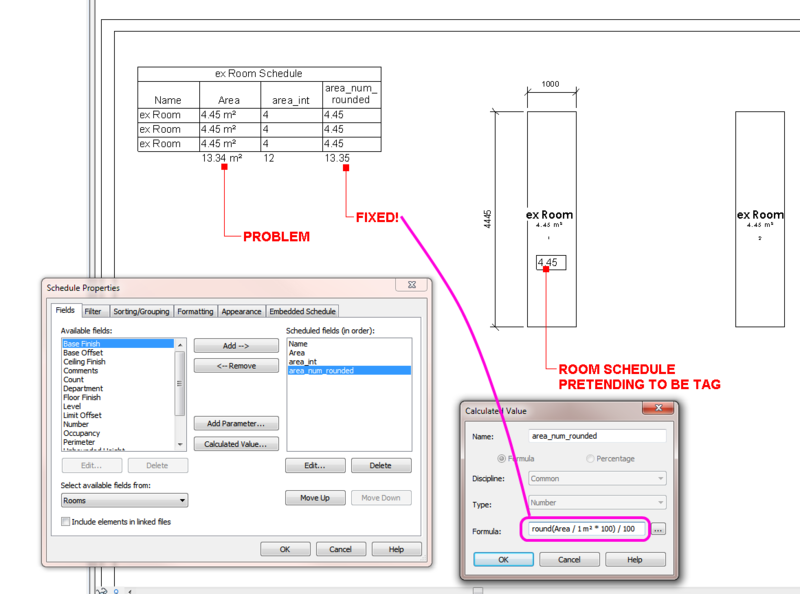 A Model Family with built in nested annotation labels that needs to be manually stretched and updated to the assumed X / Y dimensions of the Room. Just place the family and then adjust the grips. I can’t take credit for the Calculation method. 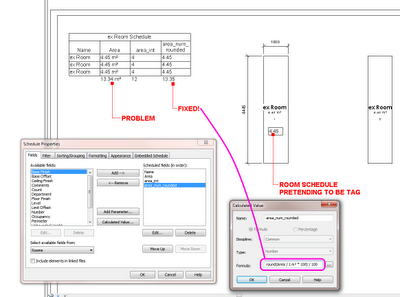 This uses a formula based on Perimeter and Area to establish calculated values for X and Y room dimensions in a Schedule. I downloaded an RVT back in 2008 that demonstrated this method — from … somewhere. Similarly, I can’t really take credit for the Model Family with Annotation Labels idea for the family either. Daryl Gregoire posted it years ago in a series of videos, and it was mentioned in this post as well. Download this file to see both methods in action. Be sure to review both the Floor Plan and the Schedules to see how it all works together. 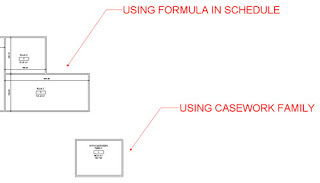 I chose Casework because it has built in X, Y and Z parameters – meaning I did not have to use Shared Parameters. I control visibility by placing these Casework families on a secondary Design Option. You could actually use a standard Casework Tag instead of the built in annotation if you prefer. 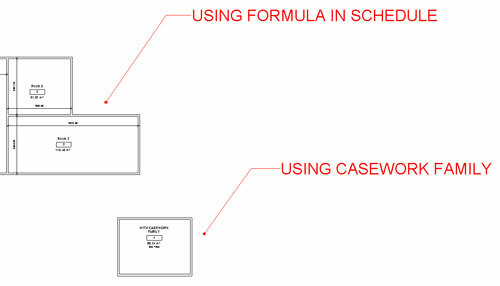 The Casework Schedule is filtered by Type Comments, and the other good thing about Casework is that we can Schedule the Room that the Model family lives in. Thanks to one of our readers, we have a solution for the schedule precision problem described here. The comment below the lines gives the formula to convert an Area into a rounded number in a schedule, and the totals work! Thanks Максим Ашихмин. One workaround is to convert the Areas into Integers (using a Calculated Parameter), and hide the original Area column … still doesn’t exactly work sometimes. While you get an illusion of consistency, you tend to lose precision. The reason is that the overall rounding of the figures does not necessarily match the individual rounding of figures. For example, lets say you have 3 areas of 4.4m² each. Using rounding to 0 decimal places by using the precision settings, you will get 13m² for the total, but using the integer method above you will get a less accurate but more consistent 12m². I wonder if a percentage based technique could be used? It still wouldn’t be ideal, particularly if there were some ‘dumb’ constants that had to be added to Calculated Parameters. 4. Check off “Itemize every instance”. If you did it correctly it now shows proper totals. This takes some fudging to get it right. If you can’t get it done, post an example. Martijn de Riet has pointed out something very useful when you are trying to use a Calculated Value to pull together a bunch of similar-but-different parameters. If you come across an error, don’t forget about the ‘Add to all elements in the selected categories’ check box in the Parameter Properties dialog. After creating the schedule you figure: let’s create a “scheduled width” parameter which adds up all those separate width parameters. This way you can clean up your schedule (fig 2). Only to find that it won’t calculate. In this case, the family “ontwerpraam doesn’t have the parameter “breedte_vo” so in the schedule it returns no value. Therefor, the total cannot be calculated (fig 3). 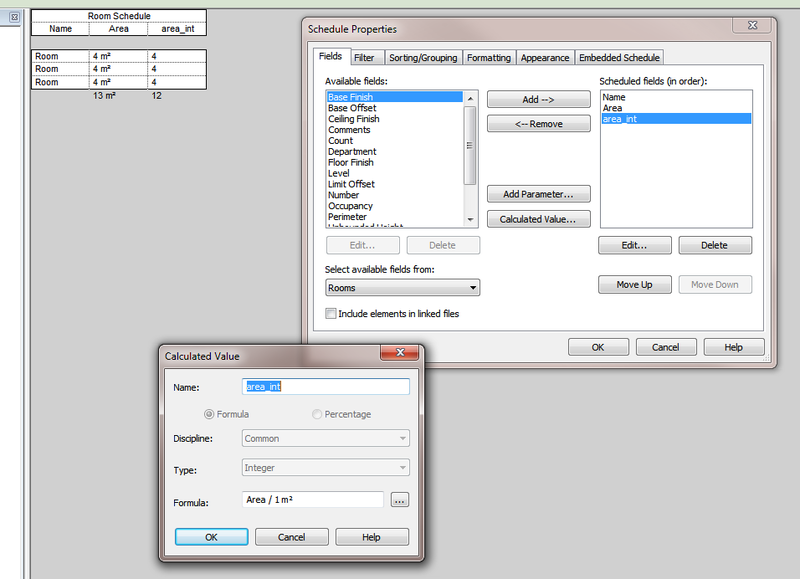 Open the schedule properties, go to the Fields Tab, select the parameter causing problems and click Edit. In the Parameter Properties, check the checkbox “Add to all elements in the selected category”, select the category “windows” and choose whether it should be an Instance or Type Parameter (fig 4). The parameter is now accessible in the schedules, even with the families it’s not actually in. 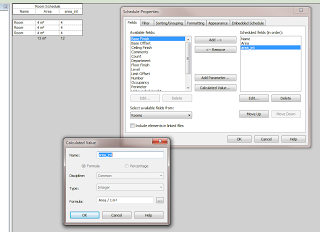 You can now fill in a value and the Scheduled Width parameter will calculate properly (fig 5). It will even show up in the family’s properties (fig 6).